The World Chinese Entrepreneurs Convention (WCEC) Secretariat operates as the central liaison point and coordinating centre for matters relating to the WCEC, and liaises with the host organisation of each WCEC in ensuring the smooth organisation of the Convention. Singapore Chinese Chamber of Commerce & Industry (SCCCI) hosted the WCEC Secretariat for the first 6-year term commencing from October 9 1999. At the closing ceremony of the 8th WCEC in October 2005, The Chinese General Chamber of Commerce (HK) took up the post of the secretariat for a term of 6 years to continue fostering the network of Chinese entrepreneurs worldwide. The Handover Ceremony on October 7 2011 was the start of new beginnings for the Convention as a whole. The momentous occasion saw the Thai-Chinese Chamber of Commerce (TCCC) take the reins from The Chinese General Chamber of Commerce, Hong Kong (CGCC) as host of the WCEC Secretariat for a 6-year term. It was also announced that the 12th WCEC would be organised by the China Overseas Chinese Entrepreneurs Association and held in Chengdu in 2013. Handover of the WCEC Secretariat from CGCC to the TCCC (presentation of the official seal from CGCC to TCCC). 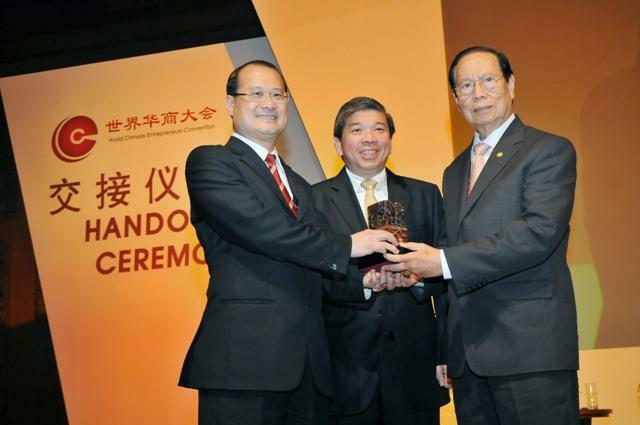 From left: Jonathan Choi (Chairman of CGCC), Teo Siong Seng (SCCCI President) and Suthee Meanchainun (President of TCCC).